Yesterday I went to two seminars organised by the CILIP Career Development Group London and South East division: ‘Portfolio Building’, and ‘Chartership and Beyond’. You might notice a slight Chartership theme there... ‘Chartership and Beyond’ is the compulsory course for all Chartership candidates, so there are no prizes for guessing why I went to that one. The Portfolio Building seminar was a voluntary half-day course (very reasonably priced at £11.75) which I chose to attend because I’m currently trying to turn a large pile of evidence into a portfolio, and I’m keen for any guidance on how to do that. Both seminars ranged across a number of topics, but the key theme of the day for me was “How to make your evidence meet the assessment criteria through the intelligent use of reflective practice”, or “How to pass by making sure that your select, present, and justify to show yourself in the best light”. A couple of things from the two session particularly stood out and deserve individual credit. Sabelo, a Candidate Support Officer from the CDG group had compiled seven reflective diary questions tailored to evaluating an event you were a part of - I used those as the skeleton for this post. Also Michael Martin’s presentation on the whole Chartership process was informative, encouraging and reassuring. I felt relieved that nothing he said came as a complete shock - it’s nice to know that I’m on the right track! Before the day started I was perhaps a bit cynical about the courses I was attending. I had unfairly assumed that they would come across as being solely about how to tick the boxes on an assessment form. I wasn’t expecting to find the reflective practice exercises so useful or enjoyable, or to come away feeling that I could apply what I had learnt in contexts wider than just Chartership itself. From the two sessions I gained a much better idea of how to organise the physical evidence for each item included in the portfolio. It’s not just about having a single piece, e.g. a certificate or review, it’s about creating a short narrative, e.g. an event flyer, a visitor feedback form and a critical reflection on what happened and what you’d changed. I’m also now more comfortable with the requirements of the four assessment criteria, and have a clearer idea which evidence best illustrates each of them. I’ve identified things that I’ve done at work that meet various of them, especially the two part of number 1, that I had previously considered for inclusion in the portfolio. An example of this is linking the organisation of Open Libraries as part of Open Cambridge to the role of the library and the College within the University. I’ve been converted into a fan of reflective writing (hence all this droning on). I used to be able to see that it ought to be useful, but I’d never really got much from the reflection I tried to do. I thought that working from a list of questions to ask yourself was probably a bit of a gimmick. But now having been forced to try it out, and to listen to other people’s evaluations using the same scheme, I can see that a set of fairly basic questions in a number of areas can help you to think of ideas and connections that would otherwise have gone unnoticed. I would have liked to have had more time on the day to talk to the other participants (not that there wasn’t time allowed for that in the schedule). Near then end of the morning session I had a really interesting conversation with a librarian from a London University with a large mature student intake about strategies for making inductions accessible and successful. I wish now that I’d taken her details so that we could continue the conversation afterwards. I’ll naturally be trying to use all that I learnt from the day as I work towards assembling my portfolio. One of my first actions will be to renew my efforts to group my evidence under the 4 assessment criteria, and I’ll be writing up reflective thoughts on some museum visits quite soon too. I’m also going to write up my own personal list of evaluative questions that can be used for most reflective situations, incorporating ideas from the different examples given throughout the day. Lastly I’m going to get down and read a couple of portfolios and try to analyse the way in which their authors have organised them to meet the requirements. Thank you very much to the event organisers and presenters. Next time can we have better weather, please? Yesterday I was in London (more on that to follow) and to fill some time in the afternoon I visited the Cartoon Museum. The current special exhibition there is 'Toy Tales: Highlights from Favourite British Children's Animation', which includes (amongst others) actual Clangers, a real Bagpuss, and the cut-out figures used in Noggin the Nog and Ivor the Engine. It's wonderful and you should go. You'll have to go quickly, though, because the exhibition ends on 5 September. If you are going to London in the next few days, I heartily recommend a visit. Your usual library programming will resume shortly. Thing 23: "If we shadows have offended"
I came to Cam23 expecting it to be a pleasant summer diversion, a feather for my Chartership cap, a chance to have a tinker with a few Zeitgeist-y toys. I come away from it better connected, better informed, excited about the future and (though I know not how to measure it) more professional. Before the programme started I was already an occasional personal user of some social media, including Facebook and Flickr, but I had been reluctant to really engage with the 'social', preferring to keep myself to myself. I was well aware that ‘the future’ was having an ever-greater impact on library work, but felt intimidated by talk of e-libraries, m-libraries, mash-ups and the like. The Libraries@Cambridge conferences I’d attended had shown me that things were changing, and I could see, intellectually, that this was both true and worth investigating further, but I had stubbornly been refusing to do anything more than feel somewhat bewildered and overwhelmed by the idea of change in a profession I had only recently joined. I'd heard of most of the Cambridge Things, though I had no idea what Doodle, Zotero and Mendeley were going to turn out to do. I was pretty confident that I'd be able to figure out how to use the tools - I was hoping during the course to learn why, and not just how, to put them to work, and to develop a coherent idea of what libraries are actually doing (as opposed to what technology advocates might suggest they should do). None of the Things (pace Tim Spalding) completely phased me, either technically or in terms of purpose, although I definitely prefer some of them over others. LinkedIn is the only Thing that I’m not sure I’ll revisit (although apparently there’s a strong CILIP presence there), and several have made it into my everyday life. I’ve not been as good as some at sticking to library use; this table shows that some tools have found a place in my heart outside work. 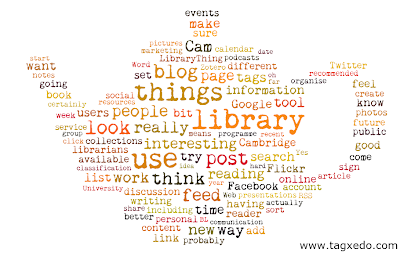 Trying out the Things, reading round them, and growing a list of library blogs to read has helped me to face up to the monster of ‘the future’, and I’m now much more confident to engage with, rather than flee from, the technological age. In my current role there isn’t tremendous scope for developing a social media marketing strategy, but I can imagine a future in which I use Delicious or maybe Zotero to compile and make accessible resources and reading lists, or I cultivate a community of interested readers near and far via a blog and Flickr. Or maybe I’ll re-imagine myself as a tweeting reference librarian answering the world’s questions, with the answers feeding into an ‘Ask the Library’ Facebook group. Or something. What I wasn’t expecting from Cam23 was the affect on my own professional development. I’d long had a feeling that I was missing out on the stuff that was surely going on ‘out there’, and now I feel like I’m actually a part of it. Finally sorting out an RSS feed reader means that library news is coming to me, and becoming an active Tweeter has given me a sense of what the big issues, and the active librarians are. Articles in the CILIP magazines now make more sense, as I’ve often already heard about the events they report. I’m much better informed, and now have an idea whom I might ask for advice and tips if I’m thinking of trying out something new. 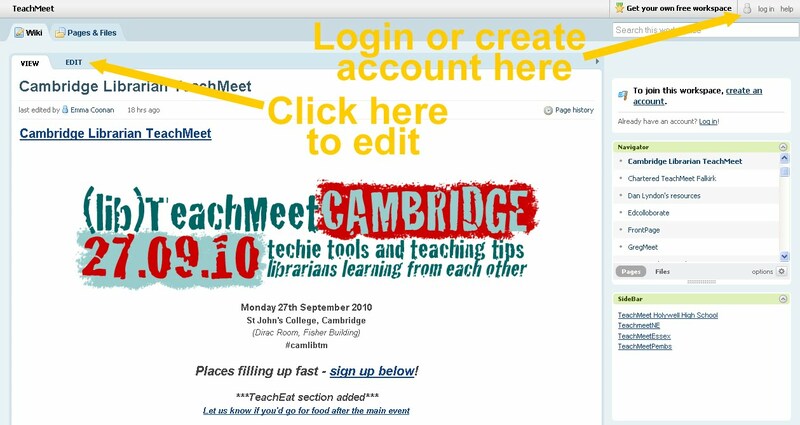 One very obvious product of Cam23 is the forthcoming TeachMeet, the organisers of which might never otherwise all have met, let alone shared any useful ideas, let alone said, ‘right, let’s do it!’. As I said in my marketing post, I’m keen to investigate library Web 2.0 use outside techie circles. (Not that things like the University of Huddersfield Library's OPAC aren’t great, but Old Things really are my first love.) So I’m trying to find archivists and specials collections librarians to follow on Twitter, and am collecting relevant blogs to read, comment on and evaluate (reading the UL’s Sassoon Project blog has already put me in touch with those organising the UL’s fledging schools outreach work). Maybe, when I’ve located it, I’ll also throw myself into the front line of social media special collections. I also plan to keep on blogging: topics already in the to-day list include Open Libraries, the cilipfuture report, and thoughts about exhibitions in libraries and elsewhere. A very big thank you to the Cam23 team, who have clearly put in vast quantities of time, thought and effort into the programme. And a thank you to all the other participants - it would have been pretty dull doing this alone! School libraries featured heavily in my reading. Given the work I (try to) do with schools, school libraries are of increasing interest. I note with alarm that the Cambridge schools library service has been closed, and read with interest tips from former School Librarian of the Year Anne-Marie Tarter on how to convince children that citation is important, and how to market the library and the librarians within a school. (Update Aug. 2010, pp. 6 and 28-30). Lastly, there's an article by yours truly in the latest issue of Sunrise, the CILIP East of England regional branch's magazine. Under the title 'The Way to the Stars' I give a brief run-down of the history of astronomy event I ran for the Cambridge Science Festival in March this year and a few tips for those thinking of organising events of their own. It should be available online in due course on the CILIP website. Not sure if this is of interest to anyone reading, but it's useful for me to record what I've read. 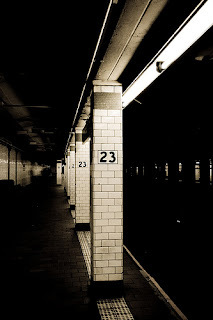 A post by Andy Priestner written to sum-up the Cam23 course stirred up quite some debate earlier this week and the ensuing discussion has been quite illuminating. Some of those who commented took exception to what they felt was the implication that everyone could get on OK by just working things out for themselves rather than expecting everything to be provided by the UL. Andy has made it clear that this was not what he was trying to say, and some UL staff have pointed out that of course they don't have life particularly easy. Indeed, many people in all sorts of libraries seem to feel that they're working flat-out, with little time for introducing extras, or consulting with others as much as they'd like to. I have no doubt that most people are doing the best that they can, wherever they're working, whether that's a small college or department library or the UL. But the thing is that 'the best that you can' is not a fixed amount. With a supportive environment a person or organisation will feel much more confident, and will be able to achieve much more than if they feel as though they are struggling along on their own, or against the tide. 'Support' can mean the provision of courses, or it can be softer: the provision of an environment in which new ideas are actively welcomed, and people have the time and freedom to try out new ideas. From what I've read across Cam23 posts, it sounds like the Judge Business School Library is a great place to work. People have reported how they've been able to try out new Web 2.0 ideas for improving the library service, and they've clearly had both the time and support necessary to do this. In an unsupportive or isolated environment, trying out the same new ideas might not actually be intrinsically any more difficult, but being, or feeling, isolated, especially in combination with the general malaise of too much work and not enough time, creates a sense of inertia which makes it hard to pursue professional development work or to take risks on new ideas. The debate chez Andy has recognised that the sense of aggrievement is in many respects borne out of poor communication and ingrained perceptions of hierarchy and privilege across the Cambridge library system. 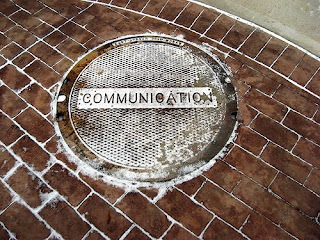 Communication has been an ongoing theme across Cam23 - there are, I think, more than a few people who feel that it could be improved (and I'm certainly one of them). Of course, it's not entirely clear how this can best be achieved, although a good first step would be to acknowledge that however hard people feel that they're trying to communicate, if some in the libraries feel like messages aren't getting through then there's probably still a problem. This needn't be taken as an accusation against anyone; when people feel like they're running just to stay still, and are implementing fixes and features in a hurry in response to urgent demands, it's surely very difficult to stand back and take a clear view of the overall situation. Poor communication, whether about particular issues such as service developments*, or more generally a sense of just not knowing what's going on, of course contributes to a sense of isolation and disconnection particularly for those who work in small libraries, are lower-down the library hierarchy, and/or are new: all groups of people who will have smaller available networks of other library staff from whom to learn what's what. Cam23 has been great for making connections, but it shouldn't take a CPD programme like this for people suddenly to feel like they're connected. At this point, I'm sure that you might be thinking that there are already lots of ways for Cambridge library staff to get in touch with each other, and that adding some other way is only going to make matters more confusing. You're right - there are already the Cambridge College Libraries Forum (which has, for example, monthly networking lunches), the brown-bag discussion lunches (not sure who's in charge of organising those), the ucam-lib-discuss email list, CamTools groups for Cambridge_Librarians and the CCLF, and the annual conference. When we look outside the University there's also the Cambridge Library Group, the CILIP East of England branch, the CILIP Career Development Group East of England division, and probably much more that I've not heard of. So why am I complaining? Well, for one, it's hard to find out about these - I've been in Cambridge libraries for 4 years now, and I only found out about ucam-lib-discuss in June (thanks Aidan!). And neither the email list, nor the nice Web 2.0 groups available (such as the CamTools sites mentioned above), nor CILIP East of England seem to be a hub of activity (this may only be an impression given by their web presences, of course). The perception that there's not much going on causes people not to bother to using them - a vicious cycle indeed. 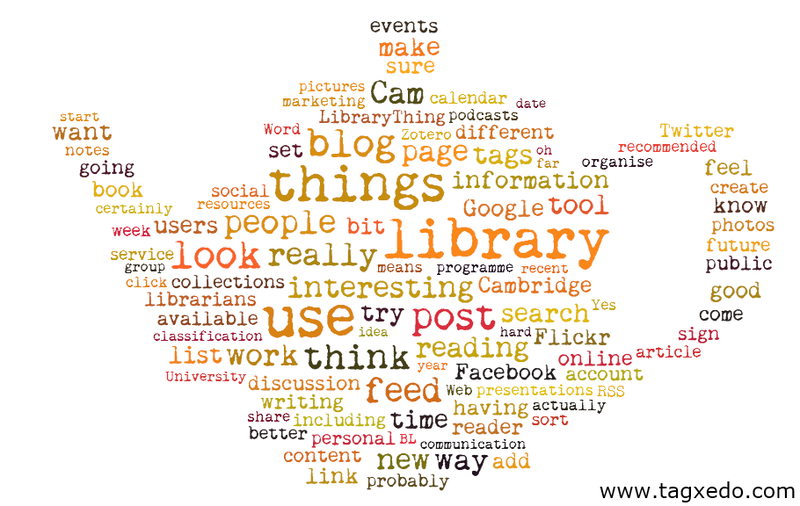 There's now talk over at Andy's post that a wiki, or, even better, a concerted effort to use, improve, and market the Cambridge_Librarians CamTools group might be a way to improve matters. I really hope that this does happen; it will need a critical mass of users and use for CamToos to become a regular port of call for library staff, but I think that this is something that could be achieved. If we manage that, then we'll only have to worry about Libby's very good point that communication isn't just telling people things, it's allowing for the different ways in which people will understand them. Food for a different post there, I think. ETA: Andy has posted about this on the main Cam23 blog, and has set up a Doodle poll to try and organise an open meeting to discuss this further. Further ETA: The meeting happened, and a wiki detailing communication channels has been compiled on the Cambridge_Librarians CamTools group. Membership of the group is open to anyone working in any Cambridge Library. *which, until the advent of the Service Developments blog, were announced only via an email list serving only senior staff who are supposed, but often do not, the forward the messages to their junior staff. Thing 22: "Run when you will, the story shall be changed"
We're using a PBworks wiki to organise the TeachMeet as that's where the TeachMeet central pages are. 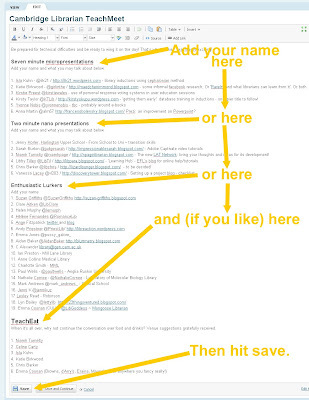 It's very easy to sign up and edit, and it a good way to have attendees manage the attendance list themselves. As well as the Library Routes wiki mentioned in the Cam23 post, I've found some other interesting library-related wikis including recently the Library Day in the Life project and the list of blogging UK libraries and librarians. Wikis seem to work really well for amassing information when lots of people have something to add and everyone wants to see the results. It is fair to say, though, that in thinking about hosting a bigger, better, TeachMeet in the future, we are considering having our own website or blog as the central online resource, because that would give us more control over appearance and layout. Yesterday I went to the University Medical Library on a visit hosted by Isla Kuhn, Reader Services Librarian and Anne Collins, Deputy Librarian. I visited along with a school librarian from Bedfordshire whom I met at the Cambridge cilipfuture conversation in June, and who came to St John's College Library afterwards with few from the Medical Library who missed the St John's tour last month. I could write quite the (dry) essay full of facts and figures gleaned during the tour, but instead I've just written up what particularly struck me, and have attempted to reflect a little on it. The Medical Library is located in the Clinical School building at Addenbrookes Hospital. Its readers include undergraduate and postgradaute medical students of the University, other members of the University, the staff of Addenbrookes and the MRC in Cambridge, and also NHS staff from across the East of England. It has about 7,000 active users. All borrowing users have the same allowance - 5 books for 4 weeks - and everyone with a library card has access to the extensive electronic resources provided. The library is clearly focussed on meeting and anticipating the needs of its users. This was clear from the determined and positive attitude to a recent refurbishment requiring a reduction in hard-copy journal holdings and the benefits that it would bring, and in the commitment to user education. The library is currently most of the way through a refurbishment and redevelopment, involving the re-shaping of the entrance area, the creation of new IT areas, the reduction of holdings of paper journal backruns, and the creation of more group working space. I was surprised to learn that the library is creating new computer rooms, as the trend at St John's appears to be away from the use of computer rooms towards the use of computers (either library-provided or personal laptops) at study desks throughout the library. This difference arises because the Clinical School requested that the Library create a new IT study room to enable them to use more computer-based modules and exams. The Librarian, Peter Morgan, presented a paper about the journal de-selection project at the 10th International Conference on Medical Librarianship in 2009. His paper and slides are available online, so I don't need to summarise the project here. I was interested to learn from Isla about a couple of features of this project: its place in the wider UK Research Reserve initiative (something I hadn't previously heard of) and the use of online surveying to obtain opinions from library users. Isla provides user education sessions throughout the year, and will talk to individuals (from her help desk in the library entrance area) and groups (in the IT seminar room) about searching, databases, and referencing "for as long as they will listen". I got the impression that she will try and sort-out any library problem that people come to her with, whether it's something she knows a lot or a little about. I'm sure that this can-do attitude encouages users to view the library staff as a help in finding what they want. In common with many libraries, the medical library has multiple 'masters'. In its case, theses are as one of the Dependent Libraries of Cambridge University Library, as a departmental library for School of Clinical Medicine, and as an NHS library. My impression was that the material required by users from these groups would be broadly similar, but that membership of several different master organisations can bring some difficulties in terms of restrictions on participation in some co-operative schemes, for example. St John's College Library has fewer masters but still has several functions to the various user-groups it serves. Undergraduates require core texts and past exam papers, undergrads and postgraduates look for somewhere to study, general interest books, audio-vidual materials (for pleasure or study), photocopying and IT facilities, and research advice. The Fellows of College appear particularly to use the reference books, paper journals and newspapers, as well and the knowledge of library staff on all manner of issues. Researchers from across the University and beyond use the resources of the special collections, and researchers, family historians and many others consult the Biographical Librarian. 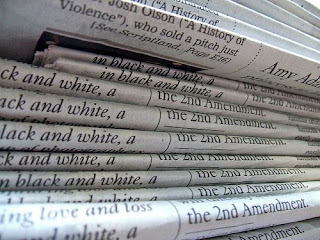 In previous employment I discovered the world of libraries in the Church of England and other Christian demoninations. Within the C of E, diocesan libraries, for example, seem to also to feel the pull of multiple organisational or user-group allegiances, both local and regional, both from the diocese but also from other affiliated instituions. Whether or not its obvious on the surface, most library services have to balance the needs of competing user groups and governing bodies, and it's necessary to recognise this and to create clear guidelines and plans for the service in order to manage such conflict effectively. In the staff area I saw a small bookshelf with copies of professional interest journals (including Update, Gazette and several others) in boxes so that staff can browse through them over coffee. I'm not sure how heavily-used these are, but it seems like a very good idea to me. I find it hard to get round to read Update at home, but if it were on or near the coffee table at work, I would probably pick it up and discuss some of the articles with colleagues (we certainly do discuss any reading material - such as the Unviersity newsletter or Grazia - that turns up). We receive some magazines at work as part of institutional body membership, and I'll see if it's possible to leave these somewhere more visible and accessible. ...a big thank you to Isla and Anne for showing us round. If I've got anything round here please correct me in the comments. The UL's Sassoon Project blog has an interesting post about their outreach work to secondary schools. I'm pleased to see the UL trying this out, and am hoping that we can pick each other's brains about schools outreach, as it's something to which the Hoyle Project is actively committed. (This one's important) Cambridgeshire Libraries are undergoing a Service Review in advance of making budget cuts, and you can contribute to the review by completing the survey and/or attending a public meeting (full details of which are available in this press release). If you're in Cambridgeshire, fill in the form and tell your friends. I went on a visit to the lovely University Medical Library this morning, and had a most informative and (chartership alert) evaluation friendly and future-performance influencing tour from the lovely medical librarians. I shall write that up in full soon. Don't forget to sign up for camlibtm. We've added a new section for those who want to come to the post-match TeachEat, too. Add your name if you want to have a drink and a bit to eat to carry on the conversations afterwards, and let us know if you know somewhere good for us to go! Thing 21: "I pray thee, gentle mortal, sing again"
With a Radio 4 habit like mine, and even without an mp3 player, you bet that I can do podcasts! Life would be unthinkable without being able to listen (again) to The Now Show, Test Match Special summaries (not to be missed just for Aggers and Boycott laying into each other), or last year's superlative Life Stories by David Attenborough (podcasts sadly no longer available, though you can buy the CD or book). Venturing outside the Radio 4 enclave, I recently discovered the University's Streaming Media Service, after a College Fellow mentioned to the Librarian that Prof. Schaffer had mentioned our Library (favorably) in this year's Tarner Lectures, and I was tasked with checking this out. The SMS hosts audio and video from Departments and Colleges, and you can register for an account online if you think you'll want to upload some content of your own. I have plans to use this service to make publicly available talks given in the future as part of outreach events here at St John's, subject to the agreement of the speakers and to obtaining decent recordings. Stepping even further afield, there are podcasts available to suit all tastes. No-one's day, I feel, can be remain uncheered when it contains a snippet from The Naked* Scientists**. They produce a podcast of their weekly radio show, as well as videos to illustrate their Kitchen Science (try at home) experiments, and also have a YouTube channel featuring (I kid you not) Science from the Sporran. Coming to YouTube, I'm sure that we've all searched it for TV programmes we half-remember from our childhoods, haven't we? Today's miscellany of disturbing mid-80s cartoon and live-action is brought to you by Jimbo, King Rollo, Fingermouse and Pob. But none of this yet directly impinges on libraries. Never fear, there's a viral video for every occasion, and today's occasion is Masters of Library Science Croquet (via almost everyone on Twitter). 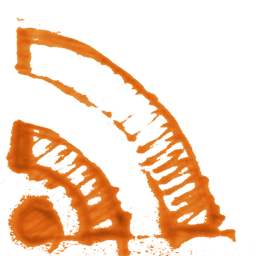 I've now had a listen to a few of the Cam23 suggested podcasts. I started at the British Library, first browsing by type and finding a public lecture about the future of taxonomy and then browsing by exhibition, and finding a short information piece by curator Vrej Nersessian on the Awag Vank' Gospels and the history of Christianity in Armenia.When I took off snuffling round the BL website to find the online version of the Sacred exhibition in order to see a picture of these gospels (BL Or. MS 13654), I was very pleased to find that the podcast in available there too, and with a transcription, to boot. 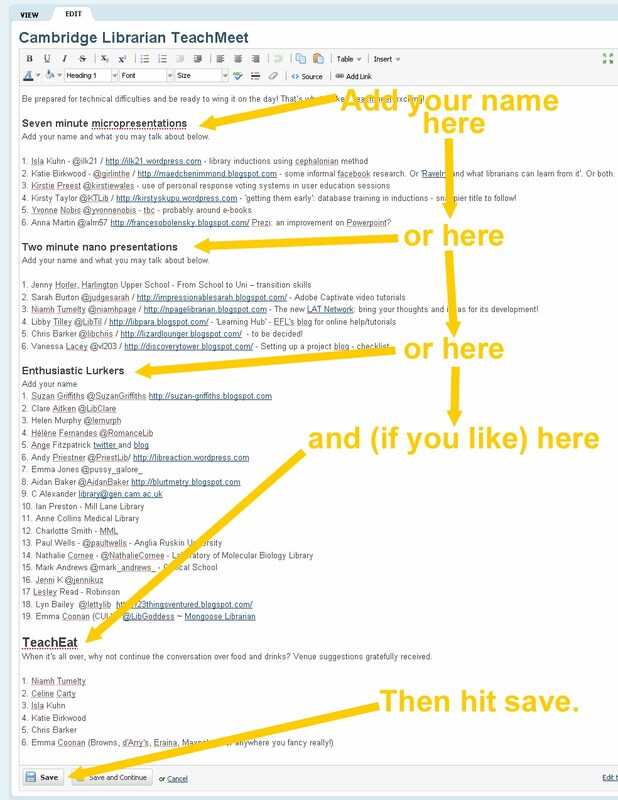 This level of integration is what really makes for a good website visit. The taxonomy lecture was also interesting (in a Radio 4 sort of way), and although it did lack something for not having the presenter's slides visible, I think it was still worthwhile for the BL to have made it available. I have plans to upload a podcast of a forthcoming library event, hopefully with accompanying gallery of pictures, and these two examples have been useful in directing my thinking about that. Next up I had a look at the CILIP and JISC podcast pages. I must confess to not having listened to anything from either of them, and I'm blaming that on them. With the CILIP page I'm just not sure what I'm getting - it looks disordered, and there's also not much to choose from. JISC has much more choice, but no summaries. The topics aren't really my favourites, and with no extra information (date, length, or content) on the main page, I don't feel tempted to click through. User-education wise I looked at the Goldsmiths Library tour podcasts. I kinda like the idea of a tour round the library, though I'm not sure how many people would actually use the audio tour in situ. But I could imagine myself printing off the scripts as a guide to the building, so there's definitely some merit there. Overall I'm ambivalent about library podcasts. The thing is that I like listening to things for pleasure, but for work I'd rather read. If I had a commute to work (and an ipod) maybe it would be different then I'd probably would listen to JISC-style professional interest podcasts as well as the best of Radio 4. And if there's a video of how to do something, then I will watch that if I can't find written instructions, although I'll almost always watch with the sound off, so it had better have on-screen text! But otherwise, I'm likely only to watch or listen for fun. But because I'm me, I leave you with this little link to the BBC Archive. It's a series of six ten-minute programmes in which genius of twentieth-century physics Richard Feynman sits in a old blue armchair and talks to camera about science. If you know nothing about atoms or quantum mechanics you'll love it. If you have a PhD in physics and now work at CERN you'll probably love it. **Conflict of interest disclaimer: one of my housemates is a Naked Scientist, and pretty much all of the house, its contents, and inhabitants have featured in Naked Scientist content one way or another. Yes, that is my cello, our tea set, our garden and our very own gherkinator. If we ever invite you to a party do come, because there is likely to be fire. I've volunteered to write a piece for the Cambridge Universtiy Libraries Information Bulletin (CULIB) about 23 Things Cambridge, and I'm looking for material. 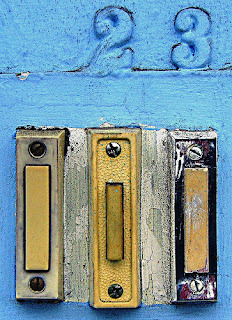 Please submit in the comments anything you think might be worthy of mention in a general summing-up article [and that doesn't fit into the Cam23 awards categories (voting opens later this week, I hear)] - funniest post or comment, most thought provoking post or Thing, favourite blog title, prettiest blog, how Cam23 has changed your life... Anything you think I didn't ought to overlook. Thing 20: "...write a ballad of this dream"
Google docs is quite easy to write about (hurrah - writing marketing was really hard work). 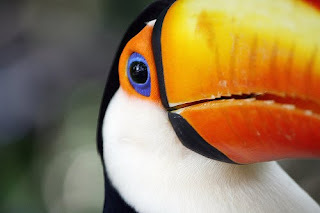 Wot? Not that sort of Docs? All the sharers need to have Google accounts, and not everyone wishes to hand over all aspects of their life to the Evil Empire. Security/copyright issues and worries surrounding Cloud Computing . To share with people you need to know what email account they use for their Google account. (We've been sharing camlibtm documents via Google docs, and discovering that the email addresses we use for preference for correspondence are not those that we use for our Google logins.) But once they're in your contacts, they're there, so that's only really a one-time problem. Useful but not life changing. Handy for staff on multiple sites. Thing 19: "I know a bank where the wild thyme blows"
Marketing feels somehow distasteful, like something that 'businesses' do but that we more refined types shouldn't dirty our hands with. We were all brought up not to blow our own trumpets*, weren't we? Well, it's clear that we have to forget that: marketing matters. In my reading of them, most of the recent online discussions about the role of CILIP and the status of libraries in society have boiled down to 'we need to market ourselves better'. Marketing is the insidious cousin of advertising. Advertising (broadly speaking) says "here's a thing, get it", whereas marketing is all about making people aware of you (consciously or subconsciously) now in case they want you later. It's not immediate; it's a long-term process. I was also (if I may be so bold as the bang my own drum briefly*) the brains (or perhaps the brawn) behind what has become the Open Libraries strand of Open Cambridge. This is an actual public event (or, rather, several events), but it is also a way of marketing the libraries of Cambridge as interesting, open and important even outsides the confines of the university. 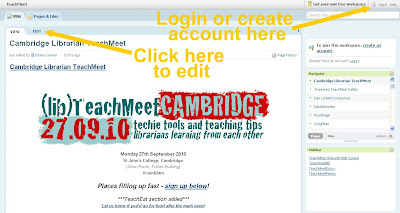 Recently I've found myself on the organising team of a Cambridge Librarian's TeachMeet, which we've been advertising only Web 2.0 ways so far - a wiki, some blog posts, a fair amount of tweeting, a Delicious tag. But this isn't really *marketing*, for all the fun it's been. In fact, none of the advertising or marketing I've done thus far has been to anything resembling a very defined strategy or plan, and before camlibtm got off the ground, I'd not really used any *social* media for those ends at all. I'm currently approaching the end of a three-year project, and I certainly wish I'd embraced some of this sooner. I think I'd like to have had a project blog, and maybe built up a bit of a following for an 'item' or 'fact' of the week. I think that some of the public who came to events (and those who couldn't make it) would be interested in that, and it might have helped showcase the project to other heritage institutions. I don't know how much point there would be in starting that with six months left to go? Magistra et mater has written a really interesting post about successful and unsuccessful library blogs. She points out that reader involvement can be cultivated by writing posts that invite comment and discussion, and which do not intimidate people out of wanting to air their own opinions. I think that fear of having an un-commented-upon, and therefore seemingly pointless, blog was one of the reasons that I didn't investigate the idea of marketing my project in that way. More fool me, I fear. As Laura pointed out yesterday, it's worth taking the risk of not succeeding, and there is a definite audience (as demonstrated by attendance at public events) who would like to see what's in our archive, so I rather think I've missed a trick. Oh well, onward, onward. I'm certainly trying to use Twitter now to spread the word about forthcoming events in which we're involved, including for Open Cambridge and the Festival of Ideas, and (if it gets organised - watch this space...) a Fred Hoyle sci-fi extravaganza in the Autumn. Not a sign you see so often. 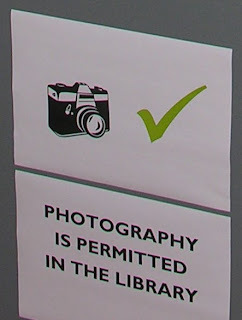 I've thought about having a Flickr group for photos of our library. 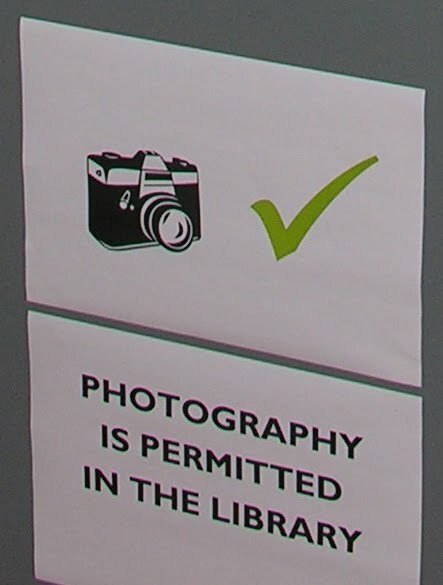 We actively allow visitors to take photographs of the library (so long as they're for 'personal' use), and there are already quite a few pictures out there. Encouraging Flickr users to add their photos to our pool would be a way of re-enforcing the (hopefully positive) message of their visit here, reminding them that they came here, giving access to more information about what they saw, and (hopefully) encouraging them to visit another event or to encourage people they know to visit. In short, it might raise our profile. But then I looked more closely at the Flickr users with St John's photos easily findable: one works in the Library, one used to work in the College, and one is Sir Cam. Hmm... will be a bit more work than I initially thought in drumming up an audience there, then. A Flickr account for images from our collections à la LoC would, I think, be really lovely. But that would probably have to Get Through A Committee. Not an insurmountable hurdle, but I'd need to develop a better case for it than "would be really lovely". I'm going to take some time soon to investigate more special collections using social media, and to evaluate further what makes some more successful than others. If anyone has any recommendations for ones to watch I'll gladly take suggestions! *Trumpets? Flumpets? Any other children of the eighties around? Remember the Flumps? To this day, I can't say "Keep it under your hat" without adding ", Pootle" on the end. Here ends the public service announcement.